Friday Night Funny time! I've seen this and similar memes all over social media lately. 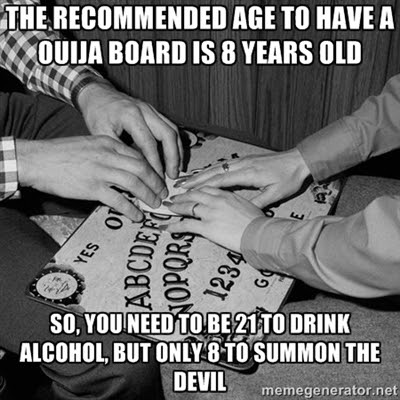 True story: when I was about 7 or 8, I actually DID try to summon the devil, just to see if I could. My plans were to try to call him out, offer up my soul, and then back out at the last minute. I wanted to see if it would actually work and he'd show up. He didn't. That started a long, long process of realizing that the religious beliefs I had been taught at an early age were necessarily....accurate, lol. I was a really weird kid. Anyway, I didn't use a Ouija Board to try to summon the devil that time...but I do have another hilarious Ouija story. When I was about 12, my 11 year old step-sister, her best friend, and I were sitting around her bedroom and decided to contact the spirit world. This was in the middle of the day in the heat of summer, but we turned off the lights, blocked out the windows with blankets, and lit a few candles. I was getting bored with the lack of movement from the board, and I apparently got a little distracted. I guess I was sitting there sort of glassy eyed, daydreaming, when I heard my step-sister start shrieking. She jumped up and ran out of the room, which of course caused me and her best friend to also start shrieking and run out after her. Somewhere along the line the candles got knocked over. Luckily, we didn't set the house on fire, but we did leave a HUGE red wax stain in the carpet that we got in big trouble over.